President Mahinda Rajapaksa yesterday issued a proclamation calling for the holding of elections to the Northern Provincial Council. Commissioner General of Elections Mahinda Deshapriya was officially notified about this yesterday, said Presidential Spokesman and senior journalist Mohan Samaranayake. Provincial Councils were established through the Provincial Councils Act No 42 of 1987 under the 13th Amendment to the Constitution and the Northern Provincial Council was first established amalgamating it with the Eastern Provincial Council. An election has not been held to the Northern Provincial Council since the Northern and Eastern Provincial Council was dissolved in 1990. Thereafter, the Northern and Eastern Provincial Councils were de-linked on October 16, 2006 following a Supreme Court order. Following the liberation of the Eastern Province under the Humanitarian Operation, elections to the Eastern Provincial Council were held on May 10, 2008. Till then all Departments, Secretaries and State Institutions functioned under the direct supervision of the Provincial Governor. The forthcoming election will go down in history as the first one held to elect representatives to a separate Northern Provincial Council. Government sources said arrangements will be made to conduct the Northern Provincial Council in September as planned and it has no need or intention to postpone it. Meanwhile, the government is planning to hold the Wayamba and Central Provincial Council elections concurrently with the Northern Provincial Council elections. Meanwhile, the Central Province and Wayamba Provincial Councils were also dissolved from midnight yesterday. Our Kandy correspondent Indika Polkotuwa said Governor Tikiri Kobbekaduwa signed the document in respect of the dissolution of the Council. The decision was taken to dissolve the Council on the request of Central Province Chief Minister Sarath Ekanayake. The Central Province Provincial Council consists of 58 members, 31 from Kandy, 17 from Nuwara Eliya and 10 from Matale. President Mahinda Rajapaksa pledged to hold the Northern Provincial Council election in September when he addressed a meeting at Kilinochchi when he opened the renovated Iranamadu Air Strip and the Jaffna-Kandy A9 road recently. The President pointed out that the people should understand how to benefit from a government, Provincial Council and Pradeshiya Sabha by obtaining services from then. He said today the North and South have been linked and his objective was to ensure to the people of the North the same rights and benefits enjoyed by the people in the South. He also requested people to totally reject at the forthcoming elections people who belittled the governments development process by spreading communalism for achieving political gain. The massive development process launched by the government after ending the war and bringing peace to the North and the granting of democracy and voting rights to the people. There has come in for praise by many international analysts. Meanwhile, a spokesman for the Elections Secretariat said they would issue a gazette notification calling nominations within a week after the President issued the proclamation dissolving the Provincial Councils. Thereafter, nominations would be entertained within 14 and 21 days. Elections will be held within 5 to 8 weeks after the closing date of nominations. HE Mahinda Rajapaksa has clearly demonstrated his impeccable democratic credentials by proclaiming the Northern Provincial Council elections. HE is our chosen leader with strength and vigour to face up to all the criticism and unjust demands of the International community, the diaspora and our meddlesome neighbour. 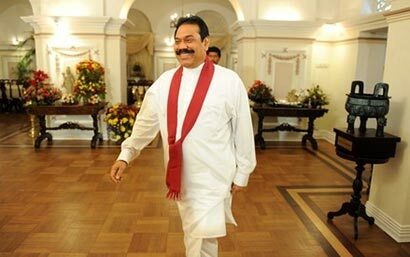 Long live HE Mahinda Rajapaksa, the country needs you not only now but forever and for ever.